I have been using a Gentle Mane Beard Care Beard Oil for the past few days. The oil is made from a base of Argan, Jojoba and Grapeseed carrier oils with a blend of Eucalyptus, Pine and Sandalwood essential oils. The result is a fresh woodsy oil that leaves your beard feeling great, despite having Argan oil in the mix it’s actually quite a thin oil and yet it still is capable of keeping my beard looking neat and tidy, It also left my beard feeling soft and natural. The oil comes in a 30ml glass bottle with a glass dropper dispenser and currently is available via their Facebook page or Instagram for £7.49 or you can purchase it with the Balm for £13.99. 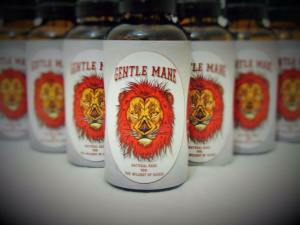 Like many people Johnny, the man behind Gentle Mane started making products for himself and to just see if he could, after experimenting for a while and becoming enamoured with the process he realised how he’d like to help others in regards to their beard needs and so Gentle Mane Beard Care was born. This brand is still in its early stages and it will be interesting to see what they have to offer over the next year. There is already a Gentle Mane soap that has just become available, it’s a tough market but I believe that it’s still possible to squeeze in and build customers via social media.